Berlin is a city that’s been dramatically shaped by the recent past, where history is a living part of the urban fabric—or in some cases, rests just below its surface. When the Berlin Wall fell in the 1989, it marked the beginning of a decades-long process that saw the dismantling of many Soviet monuments around the German Democratic Republic side of the formerly divided city. Of course, there’s plenty of pieces of the former GDR still evident, but in other cases, statues were torn down and monuments razed as East Berlin and West Berlin slowly began to knit themselves back together. Take a 62-foot-tall granite statue of Lenin that once presided over Leninplatz, or Lenin Square. The massive statue was crafted by a famous Russian sculptor named Nikolai Tomsky, who created monuments to Stalin, Lenin, and other figures around Eastern Europe in the 50s and 60s—he even worked on the Tomb of the Unknown Soldier, which still stands today in Moscow. It was one of the monuments demolished after Reunification—it was torn down “hastily,” according to Der Spiegel, in 1992. The pieces of the structure were buried. It seemed that this gargantuan relic was lost forever. But The Guardian has the story of its return, beginning with a film team that unearthed part of it for a documentary in the 90s—a few years ago, public interest rekindled in the buried statue once again. 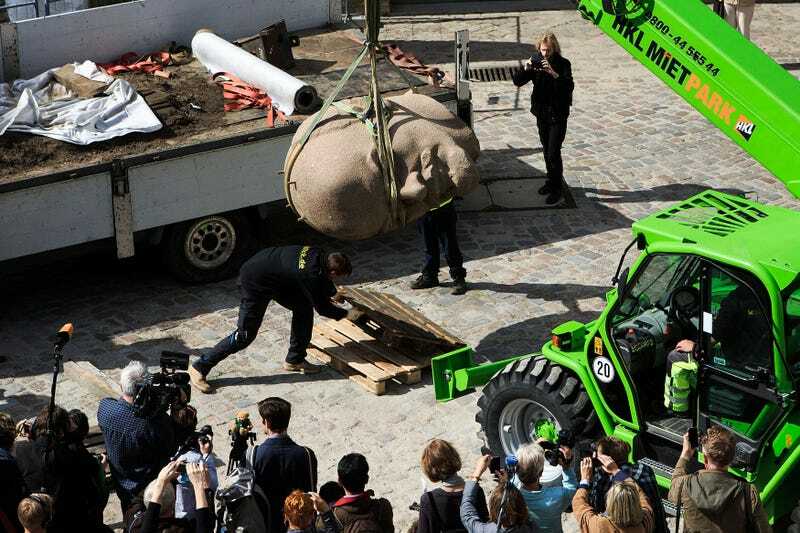 Finally, the massive head of the monument was fully unearthed by a team in Berlin this morning. The fragment, which weighs almost four tons, will be part of an ongoing exhibit of former monuments from Berlin at the Spandau Historical Museum. The inclusion of Lenin in a public exhibit signals an important and interesting moment for German culture. Remembering the past in Germany has been a complex and fraught topic for decades, but as first-generation Germans who lived through World War II age, younger generations are becoming more adamant about addressing history publicly. Then there’s the phenomenon of Ostalgie, a neologism of “east” and “nostalgia” that sprang up about a decade ago as people who were young in the GDR grew up—and had enough distance from the past to begin feeling nostalgia for it. Displaying this relic of former East Berlin doesn’t have anything to do with nostalgia, but it does stem from the same thread of interest in the city’s past—which, in so many cases, is just a few inches below the ground.